The hermit. And the traveller. 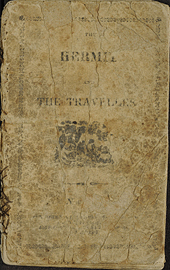 Parnell, Thomas, 1679-1718. The hermit. And the traveller. New-York : Published by Samuel Wood & Sons ... and ; Baltimore : Samuel S. Wood & Co. ..., 1818. Published by Samuel Wood & Sons ... and ; 1818. Includes "Prejudice" by Adelaide O'Keefe, p. -48. First sentence: "Far in a wild, unknown to public view, From youth to age a rev'red Hermit grew; The moss his bed - the cave his humble cell, His food the fruits, his drink the crystal well." Citations/References: Welch, D.A. Amer. children's books, 973.4. Copy in McGill Library Rare Books and Special Collections: buff wrappers.